From brushstrokes to colorful verses, the celebration of Hispanic Heritage Month continues to break down all artistic barriers between Mexico and the U.S. Some 60 poets shouted through passionate tears and struggled through difficult emotions while reading some their works aloud. Some had actually lived these narratives. A few spoke of cultural or environmental change in their border communities, and others spoke of physical, mental or emotional change from personal experiences involving the border. Poetas Migrantes would mark the end of October’s Chicano art celebration during Heritage Month. Sixty poets came from far and wide to share tales of the southern border. Topics included economic struggles, cultural integration, escape, survival and despair, along with a dash of romance. Seventeen separate events took place in the both cities named San Luis – one in Arizona, the other in Rio Colorado, Mexico – for four days beginning Oct. 18. Reading locations included libraries, universities, colleges and even the streets of both cities, with 17 timely events and each of the 60 poets scattered around in these locations including the Arizona Western College’s learning center. This would be the poet’s 11th encounter since the original one in 2007, organized by the Writers Association and Promoters of Culture of San Luis R.C. 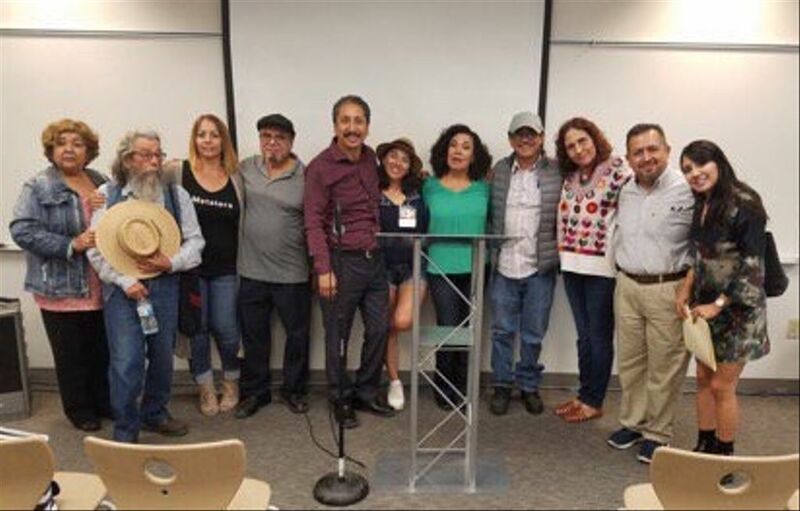 In 2016, AWC Spanish professor Martha Martinez started collaborating with the organizer of this gathering, Manuel Cuen, to introduce some of these readings to the students of AWC. Before Cuen became the organizer of this event, he worked for the Mexican Consulate. Eventually, he decided to help out the AWC-NAU Academic Library by offering them a vast collection of academic resources of the arts from the southwest borderlands, called the Southwest Border Collection. More school projects would later emerge from this collaboration. For example, AWC Art Professor Brad Pease and Martinez helped start a program on campus focusing on poetry reading, group discussions, music and writing labs. This Art Garden, whose location is yet to be determined, will be a place where art can be created, discussed and celebrated. “I went to see people collaborate and discuss poetry and the arts, and to discuss the concept of border and migrants, including keeping the culture alive,” said Pease. For him, such public events are about discussion amongst the poets and the audience to examine how the art or literature can be improved, how it can be relatable and even how it can offer inspiration. Her narrative was about the environmental and cultural change in an area she visited once for inspiration, but the focus was mostly on how she enjoys living in a rich culture that’s more authentic than contemporary society, which emphasizes economic progress over tradition, leaving nothing behind for future generations.